Ivory, gold, and snake skin- oh my! We are living for these fashion gods and their no-fear attitude when it comes to rocking these modern neutral looks. Chris Pine, dapper as ever, looks incredible in his Ivory double-breasted suit with a black bow tie and velvet loafers to match. The details are in the fit of this look, the jacket fits his shoulders perfectly, and his pant break sitting clean on top of his shoes. 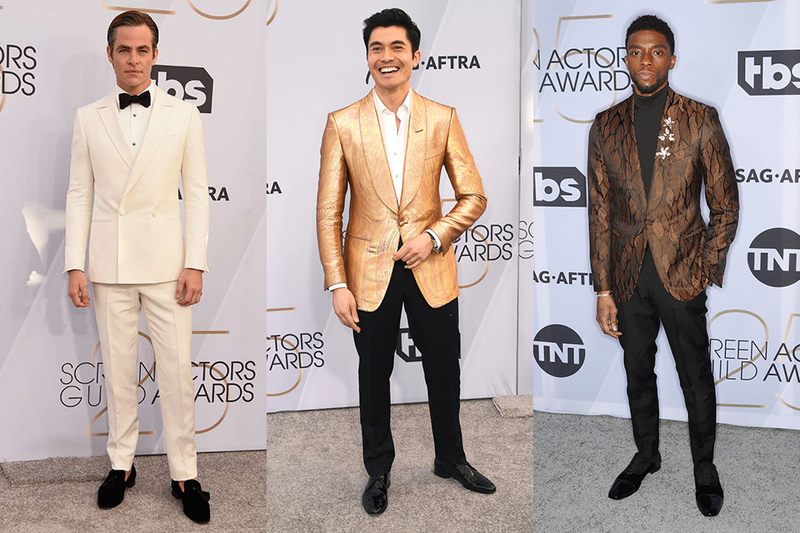 While up-and-coming actor Henry Golding, really took his name to heart with his gold tuxedo look. This jacket is EVERYTHING, and we love how he paired his look effortlessly chic with no neckwear and a simple well-tailored black pant. Lastly, Chadwick Boseman bringing the fashion up a level as always wore a visually interesting snake skin printed jacket with a black turtle neck and black pants. Also can we take a moment to compliment that lapel pin! Okay, wow! Just WOW! Not only are these couples amazingly talented, but fashion icons as well! John Krasinski and Emily Blunt rocked the red carpet in a color scheme that is increasingly becoming one of the most popular wedding colors this season, green and pink! Krasinski’s tuxedo is a deep shade of green that creates a subtle and sophisticated pop of color to any event. Our other power couple is serving up some serious couture vibes is Allison Brie and Dave Franco. Franco wore a perfectly fitting navy tuxedo with a black peak lapel and simple black accessories. Teaching us that you do not need to go over the op with patterns or accessories to look high fashion and classic. 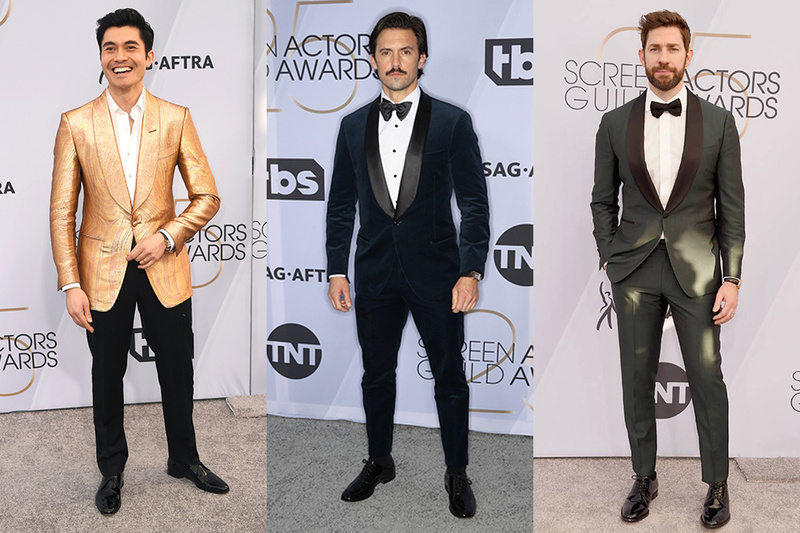 First of all let’s give these leading men a round of applause please. Not only have they served us with their amazing acting talents, but these two have killed it in the style game this award season. These two have won Golden Globes, SAGs, and the most prestigious Friar Tux Best Jacket Award! 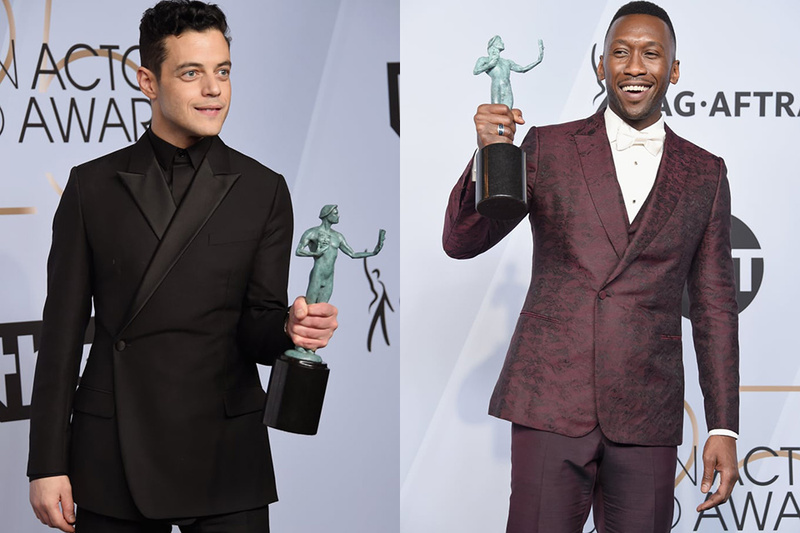 Rami Malek’s all black jacket fit him like a Freddie Mercury dream and we could not love it more. Where Mahershala Ali was blowing us all away with his wine-colors textured jacket with ivory accessories. Congrats to both actors for their successful award season thus far! Cannot wait to see what they serve us at the Oscars! These gents are not afraid of fashion, continuously serving us up some couture eye-candy. Timothée Chalamet went casual with a patterned shirt and well fitting blazer, yet adding some interest with his leather pants and boots. 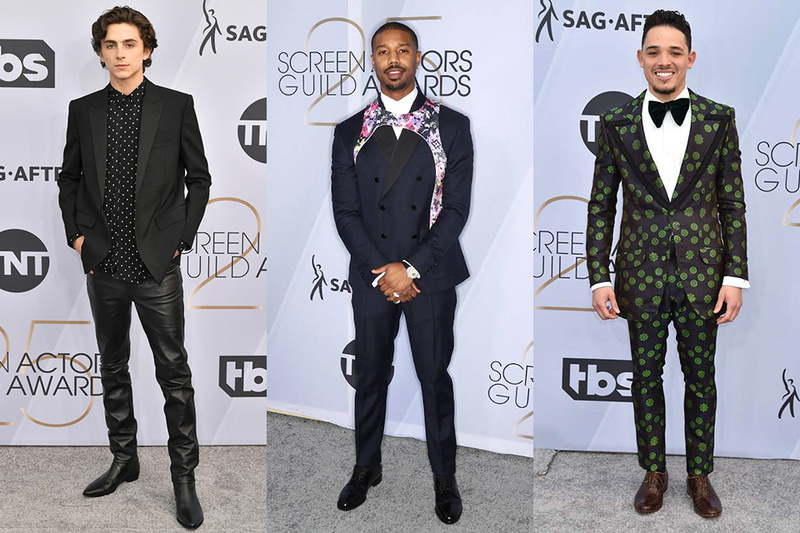 Michael B Jordan hitting us with a double-breasted jacket and a floral chest piece that adds visual interest and flare. While Anthony Ramos was not afraid of pattern with his green retro inspired floral tuxedo with an oversized butterfly bowtie. What do you think about these looks? You know you are in love when you look at your lady like this. Thank you for this moment Sterling K. Brown, reminding us that no matter where you are you can always be blown away by the sight of the person you love most.